Through a series of ongoing installations, films and publications, the project aims to give a glimpse into a near-future city co-habit with ‘intelligent’ semi autonomous, networked, flying machines. We were pleased to be invited by the V&A to present an installation of the project within the Civic Objects display at their ground-breaking show ‘All Of This Belongs To You’, running from 1st April to 19th July 2015. You’ll find our installation in Rapid Response Collecting, within the 20th century design exhibits, in the space adjacent to the smashed Snowden hard drive and laptop lent by the Guardian. The installation at the V&A contains a family of 5 drones and an accompanying film. Each drone is designed to be symbolic of the convergence of wider social and tech trends with specific tasks and functions that are gaining popularity amongst drone enthusiasts and entrepreneurs. 1. 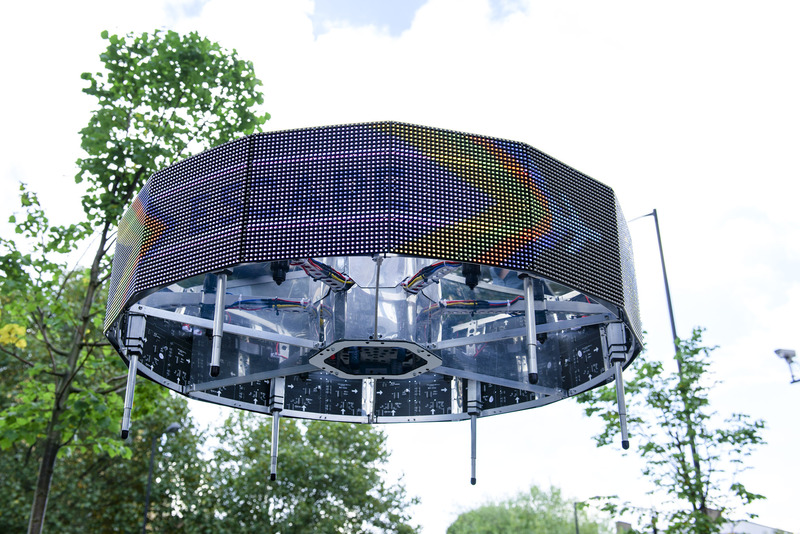 Madison, The Flying Billboard: This is an advertising drone, a hovering display platform, which can swoop, scan and hunt consumer demographics. It uses sophisticated facial recognition to gain feedback on the effectiveness of its content and to tailor advertisements to the interests of those within its vicinity. 2. Newsbreaker, The Media Drone: Supported by algorithmic monitoring news, emergency services and social media in real-time, these nimble devices push the boundaries for what has become known as High Frequency Journalism, helping feed our growing hugger for the very latest breaking news stories as it happens. As it films and streams news in real-time, story writing algorithms parse imagery, audio, web and radio traffic into rapidly growing, and continually edited, column inches. 3. 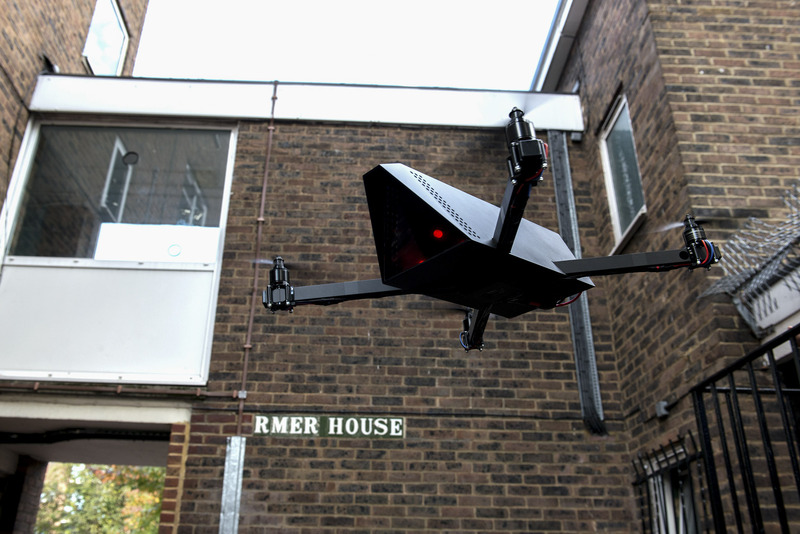 Nightwatchman, The Surveillance Drone: A highly mobile data acquisition device used by everyone from local councils to law enforcement agencies. By securely connecting to a centralised database The Nightwatchman is able to amass and utilise huge amounts of location and subject specific information assisting in everything from documenting civil offences to detecting potential terror threats. 4. RouteHawk, Traffic Management Assistant: This drone fulfills two primary functions: firstly with its high brightness LED display and powerful 8 motor design the RouteHawk can move quickly to problem situations and provide dynamic warnings to approaching drivers. Secondly its LIDAR speed detector and ANPR camera allow the RouteHawk to efficiently log and transmit traffic violations to relevant penalty enforcement departments, often allowing a unit to pay for itself within a month. 5. 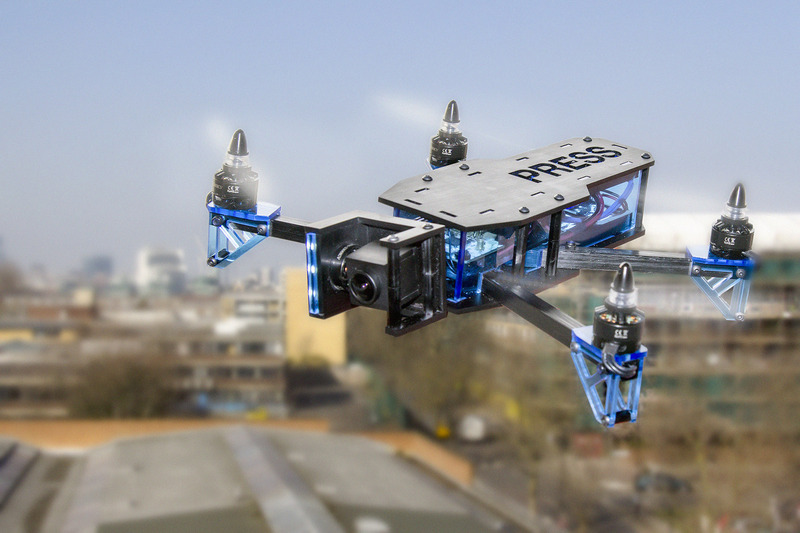 FlyCam Instadrone: A highly accessible, low cost, user-friendly platform with true ‘smart’ style functionality. 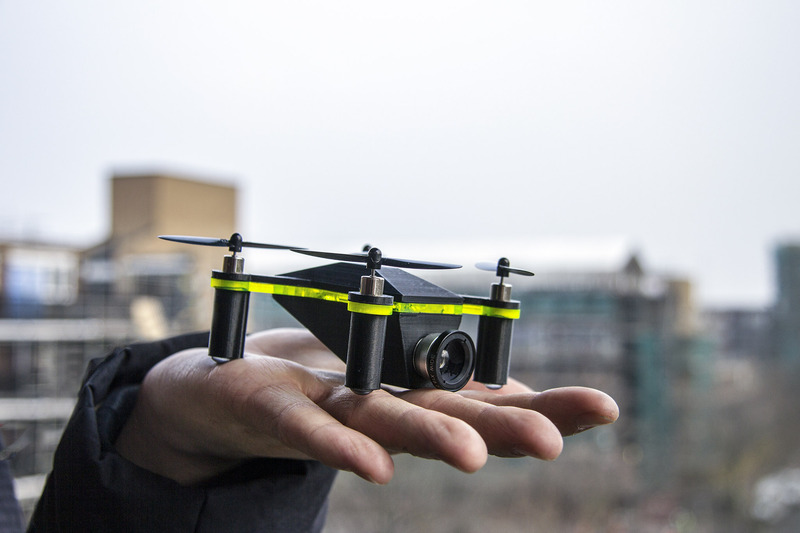 Quickly superseding the Selfie stick as todays must have life-logging and social media tool, the FlyCam allows anyone with a smartphone to share unforgettable memories from the clouds to the cloud using the Instadrone app. Additionally, its patented context aware algorithm means advertisers can deliver messages to customer when and where it counts. In order to explore the themes and ideas that have developed though our research in greater depth, we made a film. 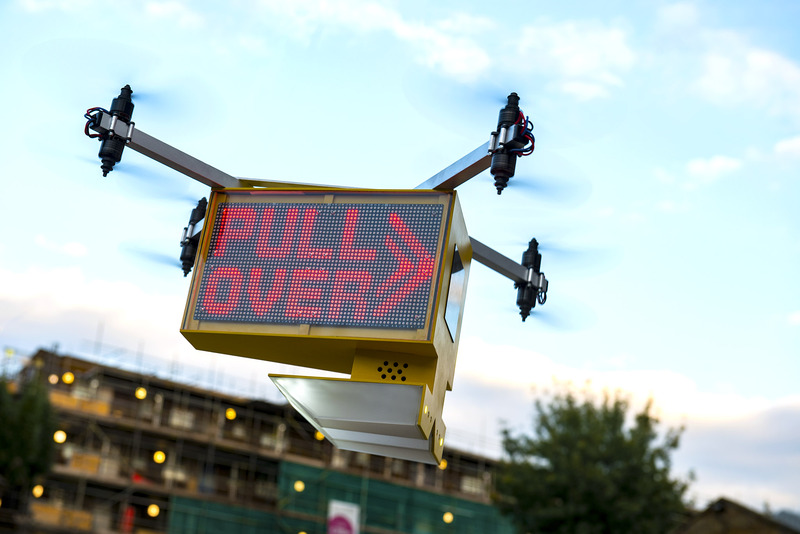 In the film, the drones become protagonists, revealing fleeting glimpses of the city from their perspective, as they continuously collect data and perform tasks. It hints at a world where the ‘network’ begins to gain physical autonomy, moving through and making decisions about the world, influencing our lives in often opaque yet profound ways. A speculative map highlights where physical and digital infrastructures merge as our cities become the natural habitat for ‘smart’ technologies from drones and wearable computers through to driverless cars. The project has previously exhibited at FabMind, 21_21 Design Sight in Tokyo, and we have written about the work for Virgin Unite. We have published a journal on our blog where share some of our intent behind the project, as well as our process of research, design, hacking, building and testing.